Mirror, mirror, on the wall, who’s the greatest cook of them all? That might not be something you’ve ever thought to ask. It just isn’t something that pops into your mind when you’re in the bathroom, bedroom, living room, or anywhere else you typically put mirrors in a house. But if you put mirrors in all those places, why wouldn’t you put them in the kitchen too? Does that sound like a strange idea to you? There are a lot of benefits to hanging mirrors in the kitchen, just as there are in using mirrors in other rooms in your home. Let’s take a look at a few of them! Do you like to be edgy and unexpected with your interior design? Sometimes it can be hard to achieve that look without incorporating something truly strange in your decor. Before you go picking out bright green shag carpet, consider this. What if you simply created something unexpected by using decor typically associated with other rooms in the house? 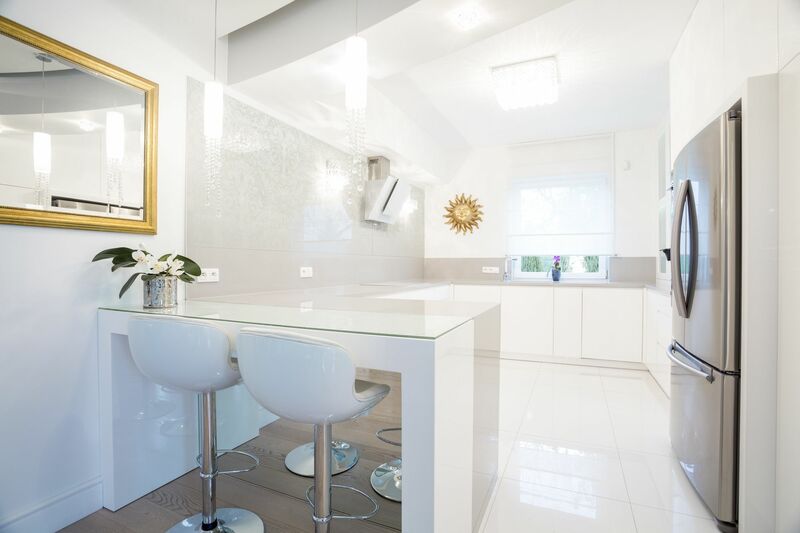 Using mirrors in the kitchen is a fantastic way to do that! It isn’t common to see mirrors hanging in kitchens. Thus, when your guests enter they’ll be delighted by this unique and unexpected element. Canadians dedicate almost 6.5 hours per week to cooking. That doesn’t even include time spent eating and cleaning up. That means that people spend over 14 days out of their year involved in just cooking. Once you factor in the time spent eating and cleaning up afterward, that amount could effectively double! Thus, it makes sense that you would want the kitchen to be a large, inviting place to be. Using mirrors is a great way to make any space appear larger, and the same is true for your kitchen. You may stop to wonder though, where to hang them? Between the cabinets, refrigerator, range hood and the various pots and pans hanging by the stove there isn’t much wall space. Whoever said that the wall was the only place to hang a mirror? Many kitchens have a backsplash that decorates the wall above the countertops and below the upper cabinets. What if you incorporated some cool mirrored tiles into your backsplash? It will help your counter appear bigger and add light to a dark spot in many kitchens. Just make sure you don’t leave a lot of clutter lying around on your counters otherwise you’ll double that effect too. Another great spot to use is the ceiling. This is a particularly great idea if your ceilings are low as it will help to open up the space and make the ceiling appear taller. Slapping a simple square or rectangular mirror on the ceiling may look a little out of place. But incorporate it into a careful design and you can create virtually any look. Make your kitchen seem more modern and chic, or aim for some Old World charm. Either look is possible with the right custom mirrors. Are mirrors on the ceiling a little too out of place for your taste? What do you do if you like the traditional mirror-on-the-wall but have no wall space? Easy! Add mirrors to your cabinet doors. This is a great way to double up on your wall space and use it to the fullest. Your kitchen will instantly seem larger and brighter–even the delightful aroma of cooking food will seem to amplify! This look is reminiscent of glass cabinet doors with one huge benefit. You don’t have to worry about keeping your cabinets neat and orderly at all times. Just be sure to follow the rules of feng shui and don’t have mirrors opposite each other. You’ll end up feeling like you are caught in a never-ending hallway of dueling mirrors if you do. In addition to making your kitchen appear larger, mirrors amplify the light. Do you wish that you had space for more windows? You might not be able to cut a window out of the wall, but you can put a mirror there. This will help augment whatever natural light is already streaming into your kitchen. Try adding mirrors to dark corners to help brighten those spaces and chase away the shadows. Something needs to go behind the stove to protect the wall. Otherwise, the heat (and moisture) from the stove will eventually damage it. Why not hang a lovely mirror there instead of a plain stainless steel sheet? It will add light to a typically dark corner and is an unexpected element that adds the right pizzazz to your kitchen. Just be sure to use a special tempered glass. Regular mirror glass will not be able to withstand those high temperatures and will quickly crack. Plus, it will break rather easily if you bump into it with a heavy pot or pan. When we first introduced the idea of hanging mirrors in the kitchen it may have sounded strange to you. But now that you’ve read about the ways you can use them and the benefits they provide, it probably doesn’t seem so strange. Try it out! Take a look and see what creative ideas you can come up with to decorate your kitchen with this extremely effective and useful decorating tool. Don’t be afraid to give us a call today to start working on the perfect custom mirrors for your kitchen. We’ll help you create the perfect look for your edgy and unexpected new kitchen decor!